Discussion for the Akira Powerbike Page. 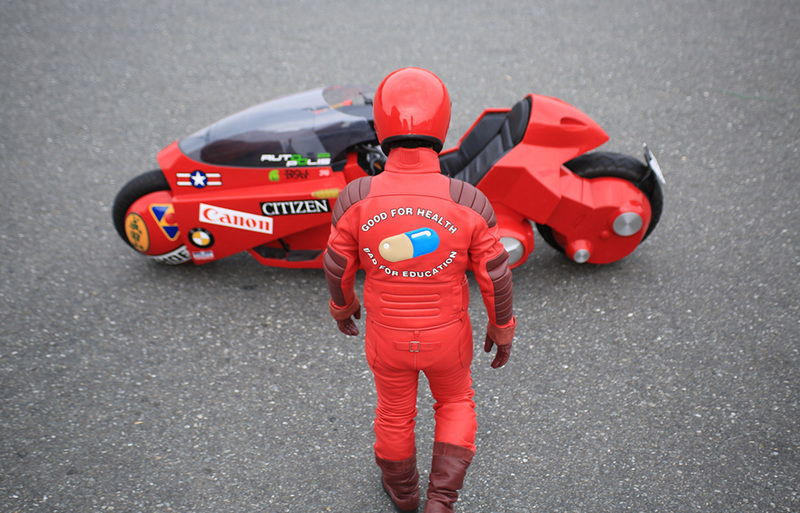 Geekologie wrote: This is a replica of Shotaro Kaneda's bike from Akira, built by Masashi Teshima over the past seven years for a cost of around $120K. It's the only replica with the official blessing of Akira's creator Katsuhiro Otomo, and now Teshima is riding the bike across Japan to raise money for children's autism. Afterwards, the bike will be on display at an exhibit celebrating Akira's creator, where it will be raising money for victims of last year's earthquake/tsunami. And after THAT, it will be purchased by yours truly and ridden up and down the street while wearing a Godzilla mask and yelling at my neighbors about the dangers of nuclear proliferation. They will call the police. There will be a chase, and I will crash into a mailbox trying to jump a curb. I will be tazed and, God willing, not evacuate my bowels this time. You can't make friends in the clink with soupy drawls! Last edited by NEO on Sun Apr 29, 2012 4:14 am, edited 1 time in total. “Why don't you listen to something really classical, like Mozart, Mendelssohn, or Motörhead?”, Rimmer. Angoulême Festival 2016, from January 28 to 31, 2016. Katsuhiro Otomo in guest of honor. A photo contest on a stage design with the bike. Festival d'Angoulême 2016, du 28 au 31 janvier 2016. Katsuhiro Otomo en invité d'honneur. Un concours photo sur une scénographie avec la moto. Last edited by NEO on Thu Jan 28, 2016 7:29 am, edited 1 time in total. the old man, me ? I see that pinky, old man! You've been here too goddamn long to still have one of those!!! Cheers! Nice ride! Where the hell was that again? Jaeger wrote: I see that pinky, old man! You've been here too goddamn long to still have one of those!!! For real, I'm not so old, I must have half his age. Jaeger wrote: Cheers! Nice ride! Where the hell was that again? street of " Frères Lumière "
It is not a real "bike ride", it is a WALL with wallpaper on it, on a stage ! Katsuhiro Otomo sit on the Neo-Fukuoka/BSU bike in France. Merde! Show yourself, damn ye! Or is that you in the black cape at the bottom? No, I haven't been there.